George Graham Reviews Eric Bibb's "Spirit and the Blues"
The revival of the blues over the last several years has provided a lot of opportunities for talented artists to be heard on record who might otherwise just be plying their musical trade regionally in blues clubs. Another fortuitous consequence of the current blues renaissance is the increasing visibility of acoustic blues. While many blues fans, especially those relatively new to the music assume that an electric guitar is essential to play the blues, the music actually started on acoustic instrumentation in the rural South. It was only after World War II when the migration of African Americans north in search of better industrial jobs brought among them some of the bluesmen from the Mississippi, Arkansas and elsewhere, who launched the Chicago electric blues scene. The real history of the music revolves around the innovators who shaped the style on acoustic instrumentation, including Robert Johnson, Blind Lemon Jefferson, Big Bill Broonzy and many others. While there have been second generation performers over the years who have kept with the acoustic blues, like John Hammond and Taj Mahal, a third generation of acoustic blues players have more recently been creating some very fine music. Among the bright lights are the duo of Cephas and Wiggins, who carry on the Piedmont blues tradition of Sonny Terry & Brownie McGhee, as well as Corey Harris, Alvin Youngblood Hart, Guy Davis and Keb' Mo.' The latter, though not exclusively an acoustic artist, has perhaps brought acoustic blues to more younger audiences in recent years than almost anyone else, and won Grammy Awards in the process. This week we have a exceptionally fine album by another exponent of the acoustic blues, Eric Bibb, whose new CD is called Spirit and the Blues. Eric Bibb's album is interesting in a number of ways. For one thing, it was recorded in Sweden with Swedish backing musicians, and for another, a good portion of the material consists of gospel and African-American spiritual tunes, which brings out an often-overlooked connection between blues and gospel. While in subject matter, the two forms of music could not be farther apart -- giving praise versus tales of adultery -- many blues musicians got their start in the church, and there has long been a kind of cross-pollination between the forms which was perhaps epitomized by the late Rev. Gary Davis, the bluesman and preacher who often wove gospel tunes into his music. But most of the time, advocates of each style tended not to talk much about their connection. Some rock-generation performers have seen the blues-gospel relationship and occasionally exploited it. Ry Cooder has brought in gospel-style vocals on his blues tunes over the years, and more recently, Lyle Lovett has woven blues and gospel into his distinctive musical vision. With a title like Spirit and the Blues, the blues-gospel connection is up front, and Bibb's new album is one of the best blends of the two since the Staple Singers. Eric Bibb brings an interesting musical heritage to his music. The son of Leon Bibb, a folk and blues singer who was prominent part of the Greenwich Village folk scene in the 1960s, the nephew of John Lewis, the pianist of the Modern Jazz Quartet, and the godson of Paul Robeson, Eric Bibb was surrouded by music, growing up with Odetta, Pete Seeger, Bob Dylan, and Joan Baez as family friends. Bibb ended up settling in Sweden during the 1970s, apparently finding the musical atmosphere there better. He returned to New York for five years in the 1980s, but feeling that the environment that spawned the 1960s folk scene was no longer there, he moved back to Sweden. But while in New York, he re-established his musical connections, sharing the stage with many well-known artists in the field. 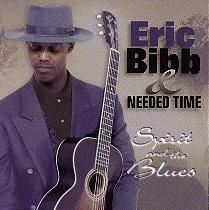 Spirit and the Blues is the US release of Bibb's second of three Swedish albums. It was recorded in 1994, but only now being made available in the US to coincide with a wide-ranging tour by the artist. The CD is actually billed as being by "Eric Bibb and Needed Time," which also includes a combination of Swedish and American musicians, including a gospel vocal trio called the Deacons. The music is a combination of traditional tunes, some old folk songs like Satisfied Mind, and a couple of originals. The accompaniment is an easy-going collection of acoustic guitar, upright bass, harmonica, metal resonator guitar, plus more eclectic items like mandolin, bouzouki, and accordion. Bibb has a warm baritone voice not unlike Keb' Mo' and he's a fine guitar player, though he does not play on every track. The material ranges from rollicking tunes with the vocal chorus testifying, to quiet bluesy laments. While much of the CD's lyrics are gospel-related, there are some more conventional blues-style songs. Eric Bibb and his mostly Swedish band Needed Time's CD Spirit and the Blues is a wonderful recording that shows how good acoustic blues can sound, and is a great reminder of the connection between blues and spirituals. The musicianship is first-rate, the generous hour-long collection of fifteen songs covers a broad range, and the album has a great good-time atmosphere. The CD's production and sound are particularly notable. With the exception of the acoustic bass which had its own separate microphone, everything was apparently recorded around one stereo microphone, so not only was the music performed all at the same time, but everyone was gathered around the mike. One can hear the stereo image shift as the musicians and especially Bibb move about a little in the course of performing. Normally, I don't much care for recordings with minimalist miking technique, but this one works remarkably well. The listening experience is even further enhanced by a mastering engineer who left well-enough alone and did not apply any significant compression to the recording, so one can enjoy a great dynamic range and presence, something which is becoming increasingly rare in these these days of badly compressed CDs designed for maximum loudness. This might be because this CD was made and mastered in Sweden, and Europeans tend to have more respect for audio quality. The only drawback is that this was an analogue recording done on vacuum tube equipment so there is a little background hiss. Eric Bibb's Spirit and the Blues is aptly named and makes for great listening. It's hard not get caught up in the music. And the CD's refreshing musical honesty is hard to resist.